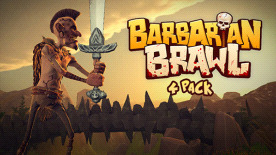 Includes four copies of Barbarian Brawl - Send the extra copies to your friends! Barbarians. Violence. Ham. Isn't that all you need to know? ...Oh, okay then. Sort of. In a small camp high in the mountains of a fictional universe that hasn't been named (any ideas? ), lives a little known tribe of Barbarians who mostly fight each other and eat lots of ham. LOTS of ham. Ham is really good you see, and it gives the Barbarians more energy to fight... and so the cycle continues. Sword – A weapon of only the noblest Barbarians. Scythe – A tool for farmers? Not when wielded by bloodthirsty Barbarians. Club – Surprisingly efficient at bashing skulls! Axe – Limbs, necks, torsos. Severs just about anything. Halberd – Keep your enemies at a distance. Knife – The pointy end goes in the other guy. Hammer – Stop! Hammer time (sorry, we couldn't help ourselves). Bear Trap – Designed to catch dinner, but catches Barbarians just as well. Guillotine – One small step...one giant … oh yep you’re fish food. Spike Trap –You won’t be walking away from this one. Spinning Trap – Whilst easy to spot you will be surprised how difficult it is to navigate safely.